How the hell did a movie with the phrase “breaks the internet” in its title make me cry? Curse you Disney, you did it again. The sixth consecutive CGI animated feature from Walt Disney Animation Studios is yet another homerun. And I’m sort of surprised it works as well as it does. “Wreck-It Ralph” was so clever and fun it almost felt like Pixar had made it. While that year Pixar gave us the more traditional “Brave” which felt like a step back despite featuring a strong female protagonist. 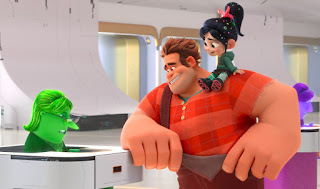 This time the lovable “bad guy” Ralph (John C. Reilly) and his colorful best friend Vanellope (Sarah Silverman) enter the magical world of the literalized internet where they come across one crazy situation or character after another (including some familiar princesses). The film initially feels like it exists solely for overt product placement and silly puns but before you know it, in true Disney fashion, a truly moving story about friendship emerges in spite of the fast-paced chaos. Can we just skip ahead to the part when all the Disney princesses show up? I won’t say anything specific other than it’s freaking awesome and hilarious. Most of the original voice actresses return to put a fun modern spin on their characters. In fact there is an entire masturbatory sequence set at a Disney fansite that feels all at once obvious and yet so truly humorous. They have a really fun time poking fun at themselves and it made me smile. There may even be an original song that I would love to hear sung at the next Oscar ceremony. Make it happen, Academy. “Ralph Breaks the Internet” benefits from knowing very little about the places it goes. And it goes to some pretty fun places. The film cleverly uses product placement in fun and interesting ways. Ralph makes great use out of a giant push pin from Pintrest. The writers have used clever ways to make use of popular bidding site eBay which is used as a major plot point. And I love how the search bar is just a guy who interrupts you as he tries to predict what you're going to say. The writers (Phil Johnston & Pamela Ribon) actually have a lot to say about the world wide web and things like social media and the state in which we live. All the filmmakers seem to be having a great time bringing this colorful and thoughtful film to vibrant life. And the voice actors aren’t half bad either. There is some great work from the likes of Taraji P. Henson, Gal Gadot, Bill Hader and more.